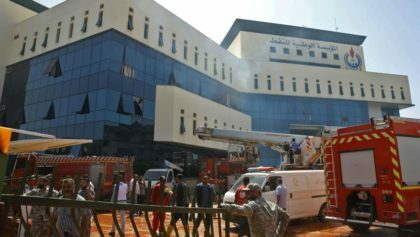 Two staff members of the National Oil Corporation (NOC) were killed Monday after ‘masked’ men allegedly associated to the Islamic State group (ISIS) attacked the Tripoli-based headquarters of the critical institution still ensuring revenues to the country. Several men reportedly stormed the glass-fronted building of the institution managing the country’s oil industry. Gunfire and explosions rang out in the building. Two people identified as members of the staff lost their lives. Ten other people were wounded. People inside the structure jumped out of windows to save their lives as Deterrence forces; a militia aligned with UN-backed Government of National Accord (GNA), confronted the armed men. Two of the assailants were also killed, the Interior Ministry said. No one has claimed responsibility for the attack, but the ministry blamed ISIS for staging what the UN called a terrorist attack. The Monday attack is unprecedented as it was directed to the Libyan oil corporation, which is among the few national institutions that have not been targets of rivalries between warring factions. NOC’s chairman Mustafa Sanallah was evacuated from the building, safe and sound. The latest attack in capital, Tripoli, took place less than a week after the UN announced a cease fire between rival factions, which had been fighting for over two weeks in and around the capital. ISIS has been almost crushed out in the North African country but still stages rare attacks against security forces and state institutions. Early May, ISIS operatives stormed the headquarters of the High National Elections Commission (HNEC). Ten security forces died and seven sustained injuries.